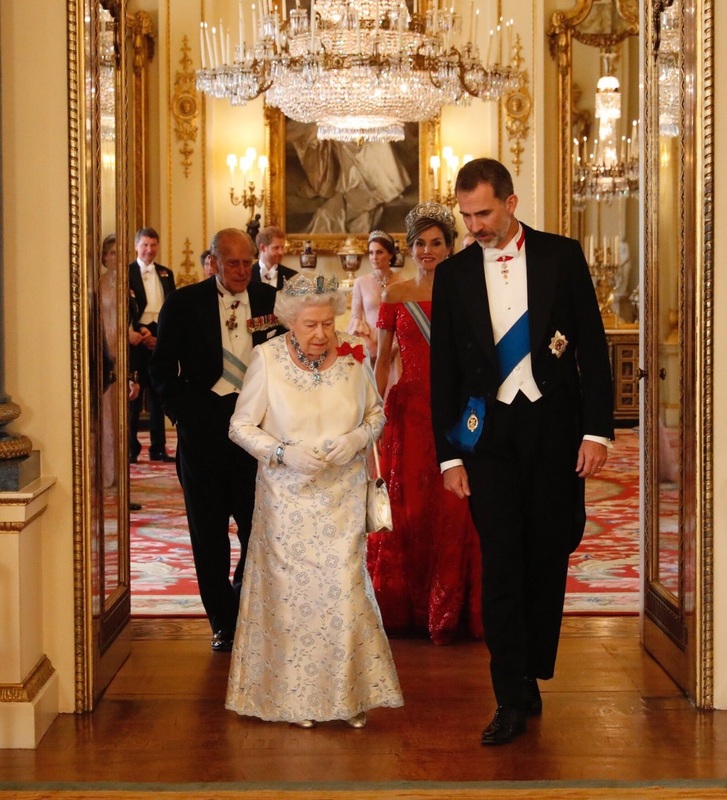 The Queen and The Duke of Edinburgh, along with other members of the Royal Family, hosted a state banquet at Buckingham Palace for The King and Queen of Spain during their State Visit to the United Kingdom. 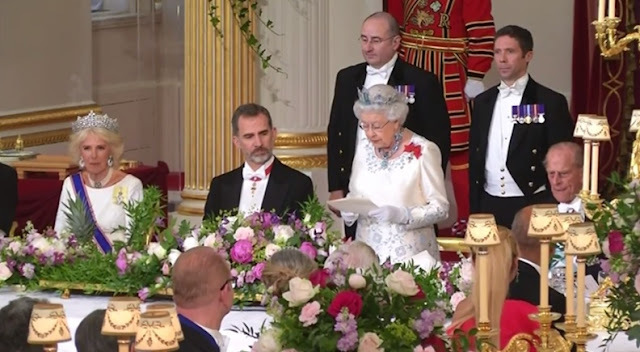 My wish for the Spanish state banquet was the Oriental Circlet and Queen Victoria's Crown Rubies. (Which is...pretty much my constant wish.) My prediction was that we'd get at least something from Queen Victoria, you know, because of the family ties and all. Her Majesty, however, is full of surprises. It's not just the Brazilian Aquamarine Parure that surprises me - and that is, by itself, a surprise; we haven't seen the tiara used since 2011 - it's the dress! There's color on The Queen's dress, are you seeing this? For someone so dedicated to her white dresses, even this amount of embroidery is a departure. Anyway, with all of this, she's wearing Spain's Order of the Golden Fleece (the red bow on her shoulder). Meanwhile, we are very much back to Business As Usual for The Duchess of Cornwall's state banquet gear: the same choker she wore for the welcome ceremony, with her regular diamond tiara. There is, however, a new pair of earrings! Another pair from Van Cleef & Arpels, and there's more info in the link below. I went into detail on The Duchess of Cambridge over at the other blog, but her loans require mention here too. 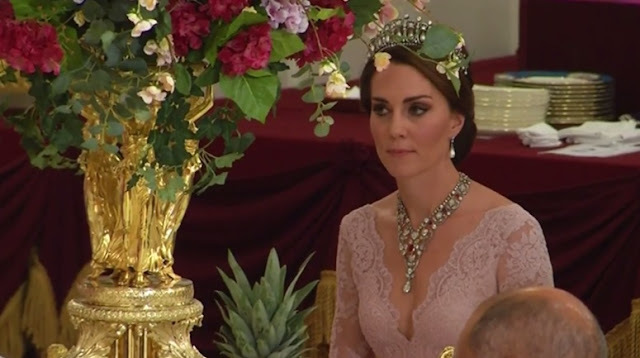 Mainly, this is the first loan of the Ruby and Diamond Floral Bandeau Necklace, which the palace referred to today as the King George VI & Queen Elizabeth Bandeau Necklace. It's one I've been hoping to see on her, as I know many of you also have. A treat! That's that. Again, more in depth coverage and coverage of others in up in full at the other blog, so check it out!